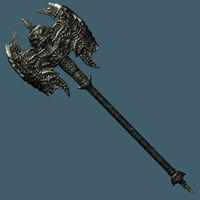 The battleaxe form of Shadowrend has the same enchantment and is tempered in the same way, but has different stats appropriate for a heavier weapon. Through a Glass, Darkly: Confront the darkness within yourself to obtain a powerful weapon. Shadowrend previously appeared in Shivering Isles. The surface of the weapons have a smoky effect, and they make a unique sound when drawn. The sword and axe versions resemble the Daedric Claymore and Daedric Battle Axe models from TES IV: Oblivion, respectively. 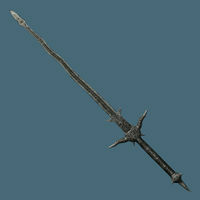 The axe version used the same model when it appeared in Shivering Isles, although the sword used a different one. This page was last modified on 29 November 2018, at 16:42.